You are here: Home › Blog › Types of Smartphones: Which One is for You? Smartphones are mobile gadgets with bigger screen, keyboard, and has the capability to operate various programs they call as applications. 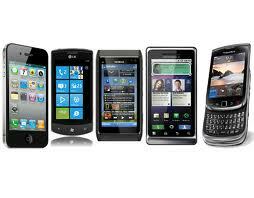 Smartphones can be the Android, BlackBerry Curve, iPhone, HTC Evo, BlackBerry Torch, and Samsung Galaxy SII. These smartphones have the same basic features and functions such as making and receiving calls, conveying text messages, listening to music, use of camera, and other basic functions. The early version of the smartphones enhanced the business activities as you can open or get your Outlook email through the smartphone. BlackBerry is considered as an extension of the office, but nowadays, almost all smartphones are manufactured with features and functions that can mix with your work or business or personal activities. There are mobile broadbands that have been enhanced with huge capacity for storage, complete internet surfing. These functions made the smartphones as small computers. In those days when these smartphones were first introduced to the market, the issue was if it fits your budget. But nowadays with the stiff global competition, you can now have one through discounts and cheap contracts. Aside from receiving and making calls and text messages, you can watch your TV show, play games, view video clips, and browse the internet. These smartphones can be availed through their app stores. What are the features to consider in choosing the best smartphone? • The operating system or OS is vital part of your smartphone. Apple and BlackBerry have their own operating systems, the Nokia through Windows, and the Motorola with through Android only, other producers are manufacturing smartphones for the Microsoft Windows Mobile and Google’s Android’s operating systems. Research on the different OS will guide you the type of operating system you need. • Will you be using your smartphone for personal purposes or business or both? Check on the features and functions that can help you on your every day’s activities. Another basic feature of smartphone is the capability to connect you to the world, whether for checking your emails or web researching, and downloading some files. With the signal capability of your mobile phone, you can access the smartphone broadband. A reliable broadband will connect you quickly with its fast connection. These smartphones are created to work well and efficiently. Each kind of smartphone provides different ways of connecting you to the internet, to the computers, and to other smartphones and gadgets. Most of these smartphones support HSPA which is known to be the quickest kind of 3G mobile broadband, including Wi-Fi, Bluetooth for wireless gadgets, and GPS for mapping.